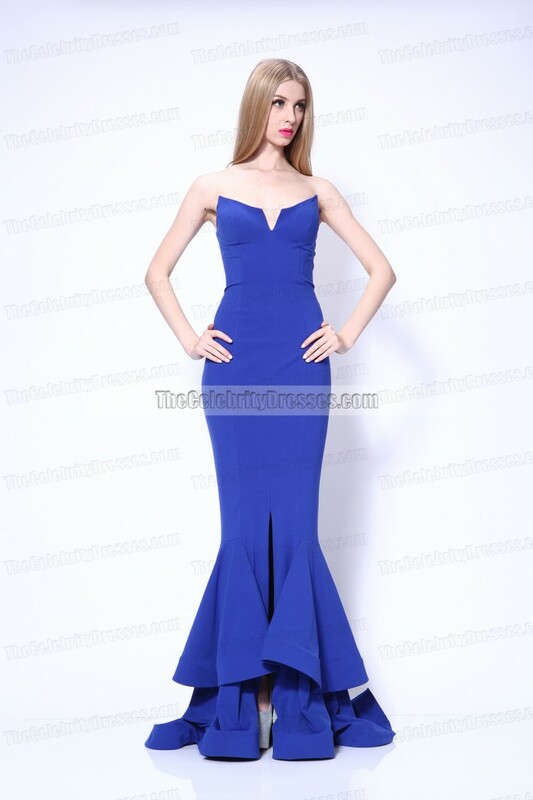 Stunning royal blue forma/ pageant gown inspired by Rocsi Diaz . "ET" correspondent Rocsi Diaz is a stunner in a royal blue gown on 2013 EMMYS red carpet . Q: Hi, can this dress be made in white? A: Dear Jessica, Yes please add the request of color in your order comment at the last step of checkout.Thank you for contacting us! A: Dear Jessica, Yes we can make the dress in white color.Please add the request of the color in your order comment at the last step of checkout so we can make the white dress for you.Thank you for contacting us! Q: Is there any chance this dress will go on sale anytime soon? A: Dear Mari, The dress is on sale now,please place your order asap.Thank you for contacting us! Q: Can this dress be made in a different fabric? If not can the satin be matte instead of shinny? A: Hello sheila, Please don't worry,we have changed the fabric now,it is made of stretch fabric,it is not shiny.Thank you for your question. Q: HI what material is it made of and would I be able to get it in red? A: Hello stephanie, Stretch fabric.Sorry red is not available now.Thanks for your question. Q: Hello, I wanted to know if it would be possible to receive extra fabric with the dress when I purchase it? A: Dear Jewel, Sorry but this dress is in stock. We do not have extra fabric for it. Thanks for contacting us. 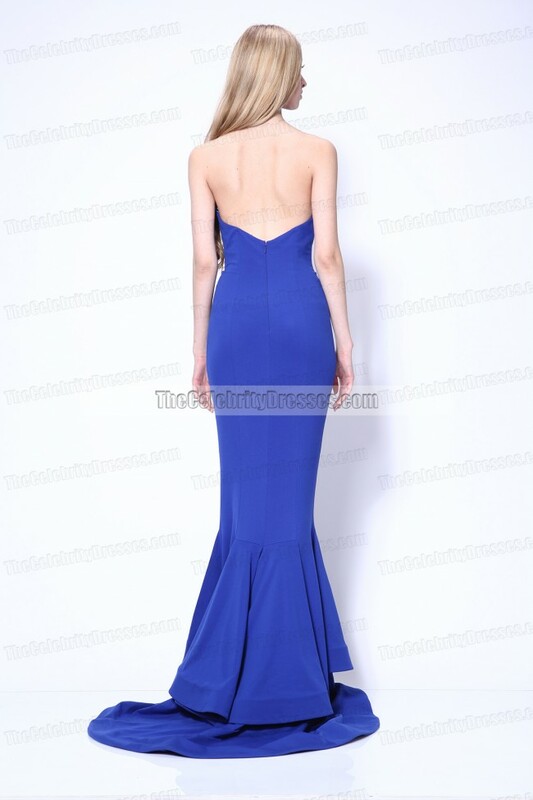 Q: where do i go to get a costum size in for this dress from this website? A: Dear Lesly, Sorry but this dress is only available in standard size now. Thanks for contacting us. Q: could i request to add an additional layer of ruffles to the train of the dress? A: Dear courtlynn, If additional layer of ruffles added, the dress would be so heavy. As this dress is a strapless style, so we do not suggest such changes. Thanks for contacting us. Q: Does the material on this dress stretch? A: Dear Armoni, Yes, it is stretch. Thanks for contacting us. Q: Hello, can this dress be made in turquoise? A: Dear Ileana, We are so sorry but this dress is only available in the showed color. Thanks for contacting us. Q: What fabric is used in the photo on the model? Is it satin? It looks less shiny than the satin I am thinking of. I LOVE how the dress is on the model and I would like to order that EXACT color and material. Thank you for creating a gorgeous dress! Also, do you have a photo of this dress on a customer?! A: Dear Tess, Yes, the model's dress is satin fabric. The satin fabric we use to make this dress less shiny than normal satin.We are so sorry but customer pictures for this dress are not available. The model's dress is the final product. Thanks for contacting us. I was so nervous to order from this website, my sister actually recommended to me and I'm so happy for this purchase, I wanted to be unique with my dress and be the best one at prom and I was, the train is beautiful, although it was a little big but i think it was cause it weighed down so from time to time when I was walking around at Prom I had to wiggle it up a bit but it wasn't bad. I'm 5'1, and I got a size 2 dress. I work Heels with it too. Many thanks to TCD lovely customer for sharing her beautiful picture. I ordered this dress for a wedding and was beyond impressed with the quality. The fit was amazing, it hugs every curve and the color is simply gorgeous. I received so many compliments that I was blown away. I plan on ordering another dress from Celebrity dresses for my next wedding later this year. I ordered it during the flash sale and I received it in less than a week. The only recommendation I would make is to add some type of wire to the V cut in the front so it doesn't droop down by the end of the night.